View out of the Marmes Rockshelter site. The Marmes rockshelter in eastern Washington State (map) is one of the oldest and most significant archaeological sites in NW North America. In its inundation by reservoir waters, it is also one of the sadder stories. Washington State University has put a large amount of Marmes material online, including several photo galleries of work in progress. The site was found in the early 1950s on land owned by Roland “Squirt” Marmes (pronounced “Mar-muss”) a local rancher, but it wasn’t until 1962 that a large scale excavation commenced. In soon order, there was a series of sensational finds of artifacts, fauna and human remains. The oldest of these dated to 10,750 radiocarbon years ago, or, about 12,700 solar years ago. At the time, these were the oldest human remains known from the Americas, and the artifacts represented one of the oldest known sites and one that was, interestingly, markedly different from the Clovis Culture type especially in the number and style of large, stemmed projectile points. Among the other artifacts were distinctive crescentic stone blades, this exquisite bone needle, beads made of Olivella shell, which must have come from the Pacific Ocean. HistoryLink.org, Washington State’s online encyclopedia, has a good summary article, and the WSU links above also give much more detail. Indeed, WSU has been doing some wonderful digitization of old projects, which I will highlight in posts to come. Things I have learned include the ubiquity of pipe smoking in the earlier days of Washington Archaeology. My only criticism of this wonderful resource is the lack of captions on the photo galleries. Who are these people, for example; who is under these splendid war bonnets? Take a moment to tell us in a caption, or the file name. The story of the inundation of the site by rising river impoundment is also of interest. The Lower Monumental Dam was closed in February 1969, and and as anticipated, the waters started to rise. 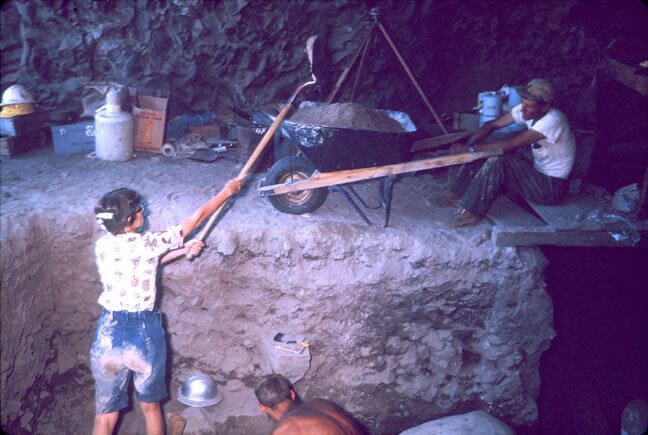 Because the Marmes site had attracted national and international attention – with several thousand visitors per day – extraordinary measures were taken to try to protect the site. Legendary Washington Senator Scoop Jackson requisitioned 1.5 million dollars to pay for a coffer dam to keep reservoir waters out of the rockshelter. The deposits themselves were covered in plastic sheeting and gravels were piled on top. 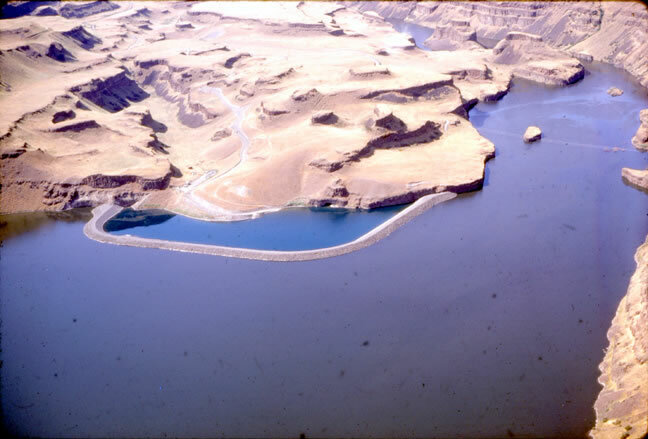 However, within only days of the water reaching the coffer dam, permeable gravels beneath allowed the site to become completely inundated, a condition it remains in until this day, where one of the major problems in preservation of this desert site is now the wakes of waterski boats. Ironically enough, the lead excavator, Richard Daugherty, left the project around this time for the similarly water-challenged Ozette Site. Keep in mind that one of the leading Marmes researchers was Grover Krantz. In the curation and inventory process, a very large proportion of the artifacts were found to have gone missing, though some of these were found misclassified. In 2005, a major summary report was published. I for one appreciate the work it takes to finish off these older projects, nice work WSU archaeology. What are the hillbilly mods to this truck all about? The hullabaloo over Marmes Rockshelter did lead to much greater US federal involvement in Cultural Resource Management. 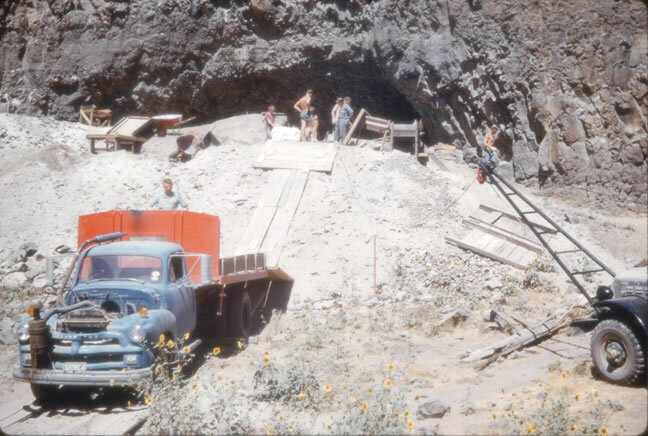 The site was excavated because of the dam project, and it must be said, there was disconnect between the rush to salvage as much as possible with the belief that the site could ride out the inundation. Much bulldozing was done to quickly get through assumed sterile deposits to the cultural layers. Most of these actions are certainly understandable in the context of the time, and the context of having found a remarkable site, perhaps more remarkable than expected. But if the 1.5 million spent on the coffer dam had been spent on archaeology 365/24/7 at the site, perhaps that would have been a better decision. You may say, well, the engineers did not know the damn would leak. I say, they are paid to know exactly that, and the hubris emodied in that technological fix resonates throughout NW North America today, where threatened sites are routinely put under geotextiles of unproven worth. The Marmes site itself, while drowned, may indeed still contain intact cultural material. As more reservoirs are drained across the Western USA, at some point it is conceivable that this or similar sites could be re-opened and nagging inconsistencies in data could be resolved. 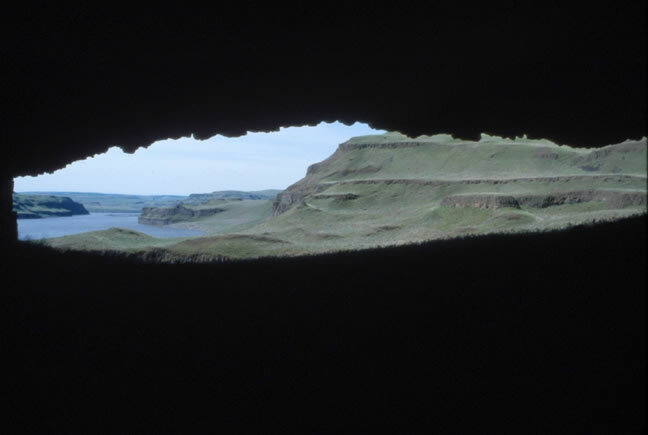 This entry was posted in Archaeology, Cultural Resource Management, Uncategorized, Washington State and tagged Archaeology, caves, marmes rockshelter, reservoirs, Washington State. Bookmark the permalink. Very cool. Coming from Washington I’d always heard of the Marmes site, but never heard anything in detail about it. Maybe that’s because I went to UW. The hillbilly mods look like an early attempt at a snorkel. It looks like the intake and exhaust are both coming straight from the engine compartment and up to keep them out of the water. Looking at it more closely, it looks like those planks right behind the truck are some sort of ramp. I wonder if they were using the truck to drive a winch, maybe off a back axle, and with it sitting there with engine running but not moving, they diverted the exhaust away from the rear end (where the working was) and perhaps they also needed to jerry-rig extra cooling capacity so the truck didn’t overheat. You can see how the exhaust has stained the front of the truck’s box. Certainly it looks like the truck was meant to just sit there and do something in relation to the ramp – back wheels are braced, the hood is off, etc. Maybe they ran it a lot so they could use the cigarette lighter or something! You can also see another somewhat hillbilly-truck to the right, what looks like the front end of a jeep with an A-Frame winch attached. surely its a jury-rigged refigeration unit for cooling beer. sure looks hot and dry. I lived at lyons ferry way back and my husband worked there so we were able to hike around the area. In 1968-1969 I was in 6th grade and we had to do current events presentations in class. I regularly did my talks on Marmes Man and found it all quite exciting. I remember being saddened by the ending. I found some fragments that had been given to my Mother in law from Washtucna. along with a paper that said; “these bone fragments came out of the Marmes Rock Shelter. She had died and we were clearing out her stuff. So I do not know when she had gotten it. You interested?